Living room, kitchen and bathroom for common use are located at the first floor. A balcony provides a gorgeous view to the Cordoaria Garden and Clerigos Tower. At the Wine Hostel Bar you can taste the famous Port Wine and most delicious Port Wine based cocktails. Here you can meet people, relax, watch a movie or football game, or play piano or guitar. You can use a guest computer, borrow a book or play board games. The staircase goes up to the last floor with the original skylight as a main decoration piece. The private rooms and dormitories are defined by classical Portuguese architecture, including high ceilings. Rooms are colourful, with a plenty of natural light. All rooms have a fan and a heater, and individual reading lights, power plugs and shelfs. The rooms are clean and super comfortable, with individual lockers and beds’ linen. Laundry includes washing machine and tumble dryer, and its use has an additional cost. Continental breakfast is buffet type, served daily, from 8h00 to 12h00. At lunch/dinner time guests can use the fully equipped kitchen or explore the numerous restaurants that are around. Our location is central, perfect spot to start discovering the city, visiting the main historical monuments on foot, surrounded by numerous restaurants and nightlife area is just around the corner. The Douro River is within 5-10 mins walking distance and the famous Port Wine Cellars are just across the D. Luis I bridge. Around our Hostel are several stops from where buses and tram will take you to different parts of the city (Casa da Musica, Botanic garden, Serralves Museum, City Park, The Ocean and beach area, Matosinhos). Busses 601 and 602 allow direct connection to the Francisco Sá Carneiro airport within 50 mins. The São Bento train and metro station are within 5 min walking distance. There you can take a direct train to Braga, Guimarães, Aveiro, Coimbra and many other cities worth to visit. Metro will take you to the Francisco Sá Carneiro airport. City tax not included – Municipal Tourist tax is 2.00€ per person, per night, PAID IN CASH AT CHECK-IN. Excellent stay. It was low season and the weather was bad so the hostel had a chill vibe but it was still easy to meet other travelers and socialize in the common area. There were also a few older groups (like 60's ) enjoying their stay. Who can blame them? Port wine is awesome at any age. BEST part of the hostel is the location, the chill bar flowing with port and whatever you wanna drink. I also recommend getting a room with the shared bathroom (not ensuite) super clean. Never had to wait. Everything was more than i expected, the location is perfect, the cleanliness was the best point for me, super clean ! The idea of giving a glass of wine at the check in is such an excellent clue ! Keep going like that Wine Hostel. Absolutely an amazing place. The place was modern, clean and the service and atmosphere was amazing. I can't believe I was staying at a hostel. It was a place with all the positives of the social life of a hostel as well as the cleanliness and modern design of a hotel. They have multiple tours that started from the hostel and the breakfast was great. An absolutely brilliant hostel. The place was clean and tidy with fantastic facilities and it was a very nice place to relax in. The staff were beyond helpful, especially when it came to renting a car to take into the Douro Valley, they even phoned up just to check the availability for us. They also had lots of great info on all the tours and things to do in the local area. 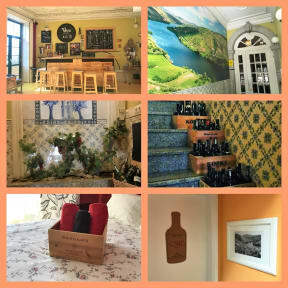 The hostel is located just a few minutes walk from everything Porto has to offer and has lots of bars and cafes nearby. This hostel is beautiful! Nice decor, friendly staff, it's spotless, the breakfast is great, pretty easy to meet people given the walking tours and (€12, a few drinks included) pub crawl. A few minutes' walk from the city's most famous sites, and near the city's nightlife spots. Can't recommend highly enough, I'll be back. We had a perfect stay at the wine Hostel! Clean, friendly staff and a nice bar! Just a few steps from all the great sights in Porto. Would totally recommend it! Absolutely loved it!! Spent an awesome week there, found such good vibes, and the staff is just absolutely amazing! ❤ They have a really nice kitchen where a rich brekky is served, and a spaceous bar room with a nice selection of port wine. Everything's very clean, and the location in the city is great, too. Will definitely stay here again, when I return to Porto! Such a lovelynplace, every inch of the place looks as though it was recently redone. It is clean and bright in every room. There was laundry services available, a bar with great prices and a clean spacious kitchen to utilise. We loved egerything about it! The staffs were very friendly and helpful! They are also really resourceful about where to go in the city. The hostel has a huge gorgeous kitchen that you can use for many purpose and a pretty well stock bar. 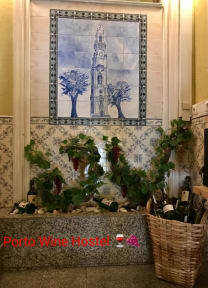 You can have an intro to port wine experience there before you go on the official wine tour. The location is dead center, you can walk to pretty much everywhere. Also a huge plus to be near the campus where the student associate usually hang out in there cool looking costume. Absolutely average hostel. The full kitchen was nice. Otherwise, cheaply done with Ikea everything, but they were making improvements. My room was easily overwhelmed by my roommates and their luggage. Staff was nice but not exceptional. Location was fine but somewhere more to the east would be ideal. The popular Erasmus bar next door could be a positive or a negative.